The Mercedes-Benz Sprinter Crew Van is more than capable on any 4x4 roads you'll find on travels between here an Patagonia. The price for the van beings at $41,495 and cost $60,450 as tested. 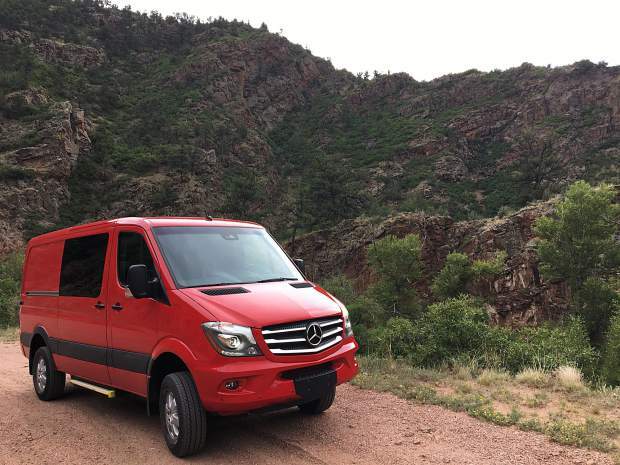 As a testament to the many pre-retired, off-the-grid, global-wanderer types I know, the enormous and fantastically flame red Mercedes-Benz Sprinter Crew Van I drove this week was right on the money, though the money is not little. At $60,450, my optionally 4×4-equipped 2500 van took a pretty big leap from its $41,495 base price, especially considering that its interior contained nothing but a single row of leatherette passenger seats behind the driver, and vinyl flooring and bare walls. But it’s the ideal platform for anyone who wants to either have a fantastic blend of passenger and delivery-service vehicle or those like my friends who will go crazy and customize cabinets, living space, motorcycle parking or the whole deal — but do not want to get into Mercedes’ full-blown Passenger Vans or the variety of pre-built RV conversion vans. There is nothing small about the 2500. In 4×4 format it is a 144-inch wheelbase model, the biggest vehicle I’ve ever driven for a car review. Luckily, it’s not quite as onerous as a U-Haul cube truck, and is actually fun to drive, once you get a handle on the proportions — the off-road capabilities being the key component to a specialty audience looking to go virtually anywhere in a not-so-tiny house on wheels. Simply getting aboard the attractive M-B van is a bit of a struggle, frankly — the vehicle rides at a 32-inch floor height up front and its body is 2 feet off the ground, so even getting up to get into the plunging footwells and into the cabin requires dexterity, and is a bit of a workout. Once in place in those optional leatherette seats, you have a view of the road that makes you feel like a tractor-trailer rig driver. You literally look down on three-quarter-ton trucks, and the Sprinter van’s unbelievably gigantic front and side glass gives you a commanding stance as you cruise along. Vehicle dynamics of course reflect the van’s largesse, but it’s easy to adapte to and surprisingly nimble on the highway or along paved mountain roads. Active lane-keep assist is there to let you know when you’ve strayed over the lines, the vehicle features built-in crosswind assist and the large, two-deck side mirrors also feature lighting that accompanies a very important blind-spot assist — critical as there’s so much body and other drivers can sneak up on you quickly. A 170-inch wheelbase version is also available, which I saw on another, fully camperized Sprinter. There are parking assist beacons on the front and back and a top-view backup camera in the rear, making parking quite simple. Power is provided by a marvelously quiet and totally smoke-free 3.0-liter V-6 diesel, which provides 188 horsepower and 325 lb.-ft. of torque. You might doubt the power when you first hit the accelerator, but give it a half second as the torque kicks in and the huge vehicle suddenly rockets away. Sustained 75 MPH-plus highway cruising is easy, and my entire experience got me 18 to 19 MPG. The full-time 4×4 system, a $7,495 option, features a high/low-range transfer case and cabin switches for hill-descent control and rear differential lock. I gave the vehicle a pretty solid real-world test by heading up the very skinny and very winding Phantom Canyon road, a former railway path turned gravel road, from the Florence/Pueblo West area all the way up to Victor and Cripple Creek, the old mining towns, and it handled the rutted and occasionally single-vehicle-width journey more than adequately. I might opt to delete the electric, self-deploying step they’d included under the right-hand-side cargo door, as it did not like the off-road jostling, but otherwise the high clearance and wheel articulation looked like the van would handle anything between here and Patagonia on your worldly travels. It would also be a little less noisy with something inside besides me and that vinyl flooring. Interior proportions are pretty impressive, though your 30-inch rear bed height is an initial obstacle. Inside, it’s 64 inches to the van’s padded roof, and overall width is 70 inches, including 53 inches between the wheel wells. I could almost stand up straight in the back. Gigantic rear doors open 90 degrees and then swing almost 270 degrees for easy loading, and the clear glass in the back helped with maneuvering, as well. Up front, there’s tons of storage in above-the-sun visor shelves and infinite cubbies and containers on the dash. That dash is also consistent to M-B’s automotive and SUV fleet, and controls and features included a small navigation screen and full navi, seat heaters and a good stereo with Bluetooth.